For an investor looking to buy bonds for the first time, navigating the bond market could be tricky because of the varied terms used to describe the characteristics of any given bond. Clearly understanding what to look for when buying bonds might help investors analyse bonds more effectively, in order for more informed investment decisions to be made. In this blog post, we will explain 5 key terms: Credit Rating, Coupon, Yield, Maturity and Duration. Let’s take the HSBC floating rate bond due 2024 as an example. Maturity date refers to the date an investor can expect to receive the principal investment from the bond, subject to default risks. This is essentially the date at which the investor will be returned their initial investment, unless the issuer declares a default at any time over the life of the bond. It is worth noting that for bonds with call options, redemption can take place well before the maturity date. 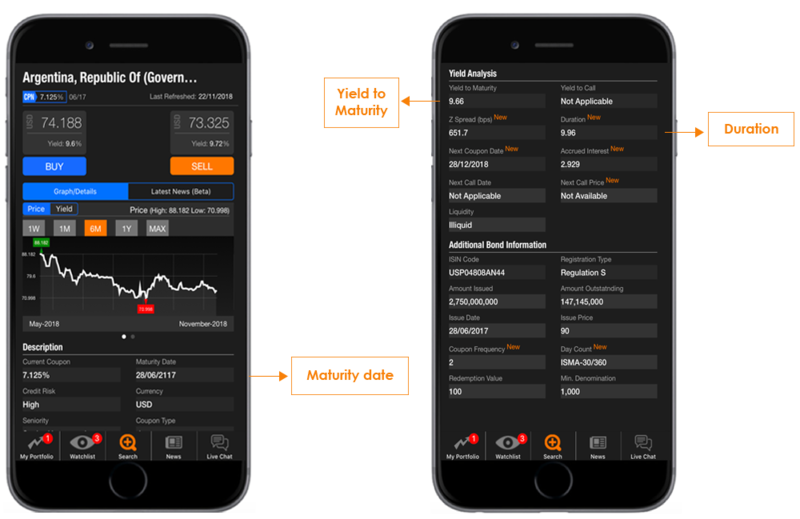 Do note that for perpetual bonds on the BondEvalue App, maturity year is indicated as 2049. 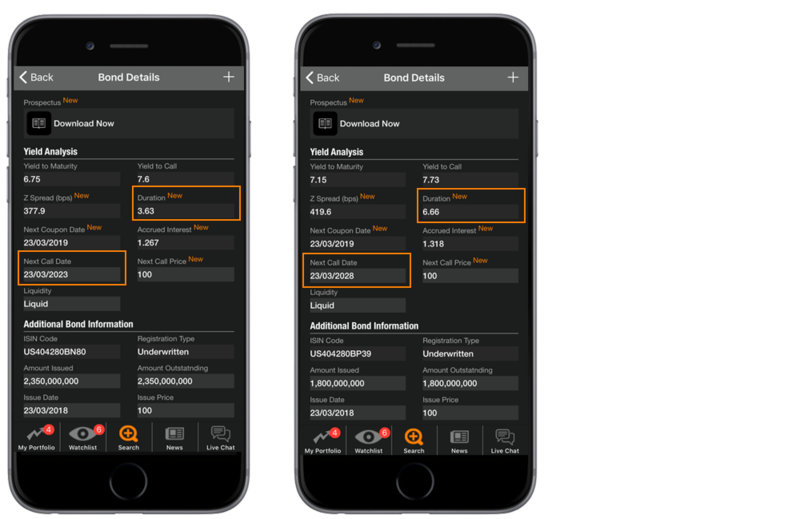 For example, the HSBC 6.25% Perpetual bond is identified on the BondEvalue App as HSBC 6.25% 2049.
Credit rating refers to the grading that indicates the creditworthiness of the bond issuer as well as that particular bond. Credit ratings can be assigned by international or local ratings agencies. These agencies analyse the financial health of the bond issuer, taking into consideration both internal and external factors that may affect the bond issuer, when assigning a credit rating. Internal factors are factors that affect only the bond issuer, while external factors are factors that affect the issuer’s industry/country as a whole. The three major international rating agencies are Moody’s, Standard & Poor’s and Fitch. Each of the three international credit rating agencies have their own credit rating scale, as shown below. The bond market broadly classifies the various ratings within a scale into two main categories: Investment Grade (IG) and Speculative Grade (also known as Sub-Investment Grade, Junk or High Yield). 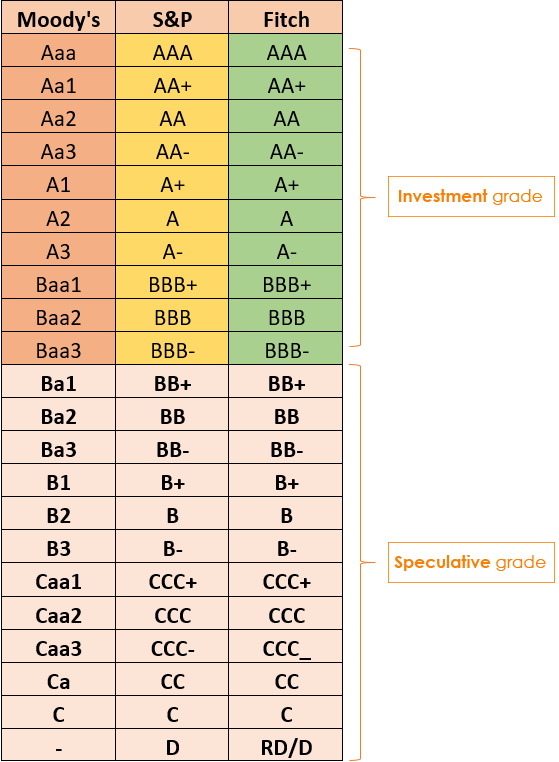 Investment grade ratings range from AAA/Aaa to BBB-/Baa3 for S&P and Fitch, and Moody’s respectively. High yield or junk ratings range from BB+/Ba1 all the way down to default. As you go lower down on the credit rating scale, the perceived risk increases. It is important to note that the bond issuer can have a different credit rating as compared to that same issuer’s bond. This may be because of the terms and conditions of that bond, which can be found in that bond’s prospectus or offering circular. These terms can include seniority of the bond (who gets paid first if the issuer defaults), bond covenants (conditions that the issuer must comply with), amongst other conditions. Hence, it is important for an investor to review the terms and conditions of the bond from the bond prospectus before making an investment decision. Generally, the credit ratings for a senior bond issue where there is no structural subordination will be the same as that of its issuer. Subordinated bonds will have a lower credit rating as compared to their issuer. For example, consider the following two bonds issued by HSBC Holdings Plc. As can be seen from the table above, two different bonds from the same issuer can have different credit ratings. In this case, Bond 2 is rated Baa3/-/BBB, lower than Bond 1 at A2/A/AA- because Bond 2 is structurally subordinated to Bond 1. Bond 2 is termed a Capital Contingent Convertible or CoCo security, which means that the bond can be converted into equity in the future upon occurrence of certain defined events. Further details can be found in each bond’s prospectus. CoCos usually sit between senior bonds and equity in the hierarchy of bank capital structure, which explains the higher coupon and lower credit rating compared to senior bonds. Where to find credit ratings? Coupon refers to the stated rate which will be paid by the issuer to the bond holder during the lifetime or tenor of the bond. Coupons are typically stated in annualized terms, while the coupon payments can be annual, semi-annual or quarterly. Bond coupons can be fixed, floating or a mix of the two. Fixed rate bonds pay a fixed coupon throughout the life of the bond. Floating rate bonds typically pay a margin over a pre-defined index, which is reset at regular periods. For example, the HSBC floating rate bond due 2024 pays a fixed margin of 100 basis points or 1% over the 3-month US LIBOR on a quarterly basis. Fixed-to-Variable bonds are bonds that have a change in coupon during the life of the bond. This change in coupon may be once or many times during the life of the bond. This structure is common with perpetual bonds wherein the coupon changes from fixed to floating (margin over an index) after a few years of the issuance. For example, in the case of the HSBC 6.25% Perpetual bond, the coupon changes from a fixed rate of 6.25% to a floating rate of 5-year US Swaps Rate plus a margin of 345.3 basis points or 3.453% on 23-Mar-2023 (bond call date). Thus, it is important for investors to understand the coupon type of a bond, especially in the case of perpetual bonds. Yield refers to the discount rate that equates a bond’s future cash flows to its market price. It is essentially the return that investors stand to receive by holding the bond. There are several types of yield, each calculated in a different manner. You can learn about the different kind of yields in our earlier blog post Bond Yields – Explained. Duration is the key measure of a bond’s interest rate risk. The duration of a bond indicates how much a bond’s price stands to change, given a 100 basis points or 1% change in interest rates. It refers to the weighted average time to maturity of a bond and is thus stated in years. Duration takes into account (a) bond price (b) coupon (c) maturity (d) yield to maturity (e) call features and/or sinking fund provisions. Duration is particularly important for investors that plan to sell their bond before maturity. This is because changes in interest rates can affect a bond’s price in the secondary market, and duration is the measure that indicates the magnitude of that price change. Generally, the higher a bond’s duration, the greater its sensitivity to interest rate changes. High duration bonds will fall in price by a greater magnitude as compared to lower duration bonds, if interest rates increase. Another important relationship to keep in mind is higher the bond’s coupon rate, the lower that bond’s duration. 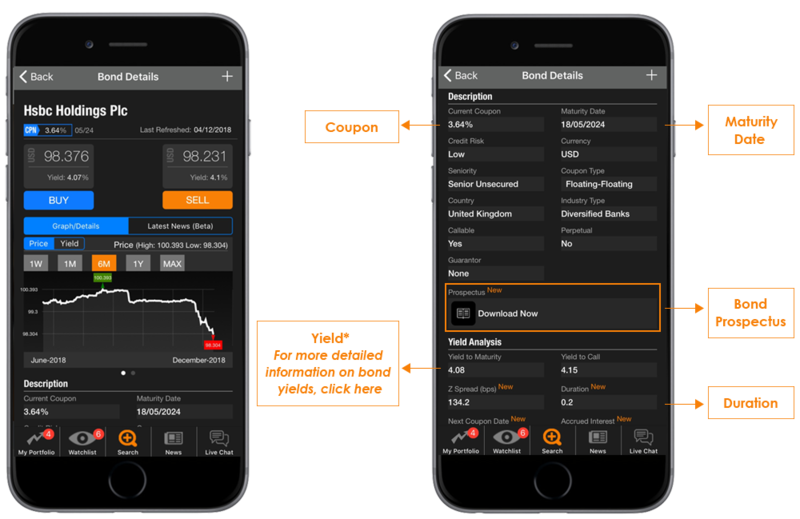 For two otherwise identical bonds with different coupon rates, the bond with the higher coupon will exhibit a lower duration. This is because it pays back investors their investment at a faster rate compared to the lower coupon bond. Let’s take the example of Argentina’s 100-year 7.125% bond due 2117. Given the relatively high coupon of 7.125% and yield to maturity of 9.7%, this bond has a duration of 9.9 years. This is significantly lower than its remaining years to maturity of ~98 years, simply because of the higher coupon and yield. In the case of perpetual bonds, call features play an important role in the duration calculation. For example, let’s compare the HSBC 6.25% Perpetual bond with call date on 23-Mar-2023 with the HSBC 6.5% Perpetual bond with call date on 23-Mar-2028. Since the HSBC 6.5% Perpetual bond’s call date is 5-years later than the call date of the HSBC 6.25% Perpetual bond, its duration is higher. The higher duration explains the lower price of the 6.5% Perpetual, as higher duration bonds fall in price by a greater magnitude when interest rates are rising. Duration of floating rate bonds are typically very short as their coupons are reset at regular intervals as per the then prevailing market interest rates. Thus, the interest rate risk is significantly lower for floating rate bonds. To put it differently, the duration of a floating rate bond with a quarterly coupon reset is roughly 0.25 years on the day after a coupon payment. This is because the bond holder bears interest rate risk for just the 3-month period up until the next coupon payment date, at which the coupon will be reset as per market interest rates. Therefore, risk-averse investors prefer floating rate bonds in periods of rising interest rates. To summarize, this post on what to look for when buying bonds aims to help bond investors to better understand bond market terminology, key risks and key metrics to analyse before investors buy bonds. The BondEvalue App allows you to analyse all of the above metrics in a convenient and user-friendly mobile app. 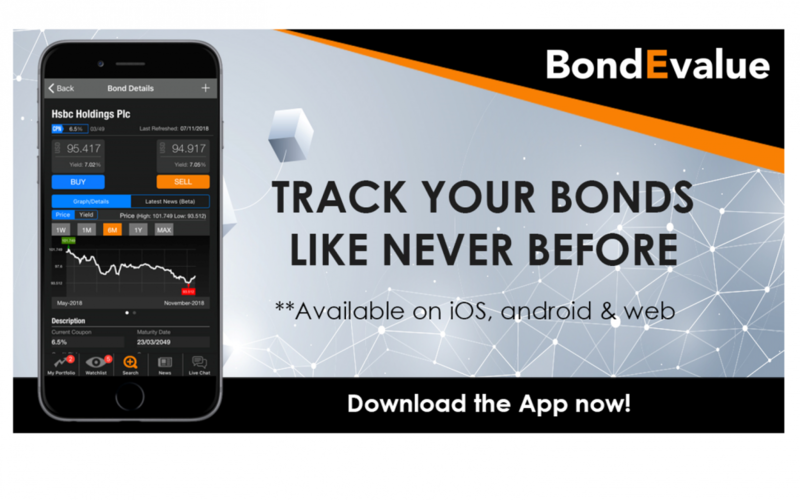 Download the BondEvalue App now – Free for 30-days!